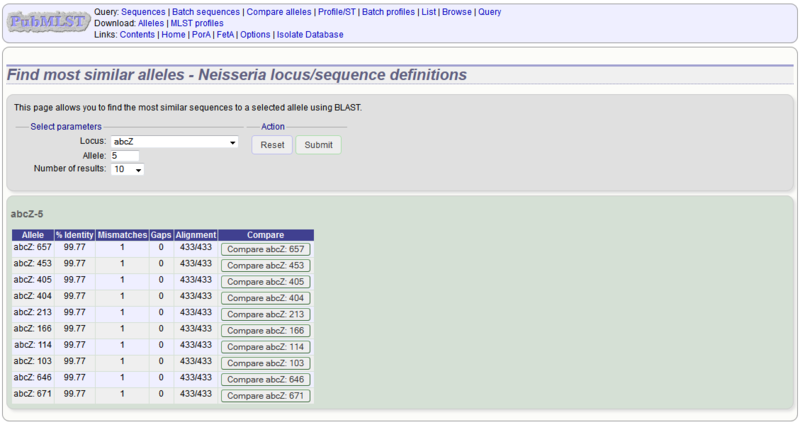 Some loci have extended attribute fields. 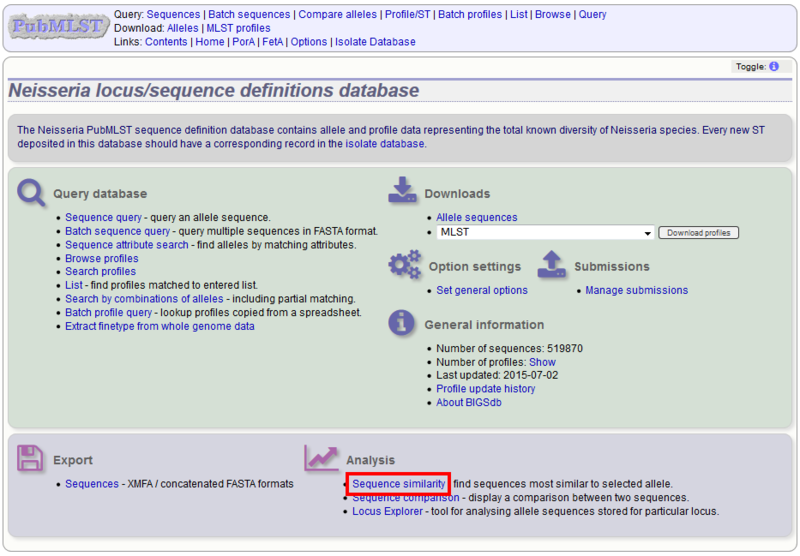 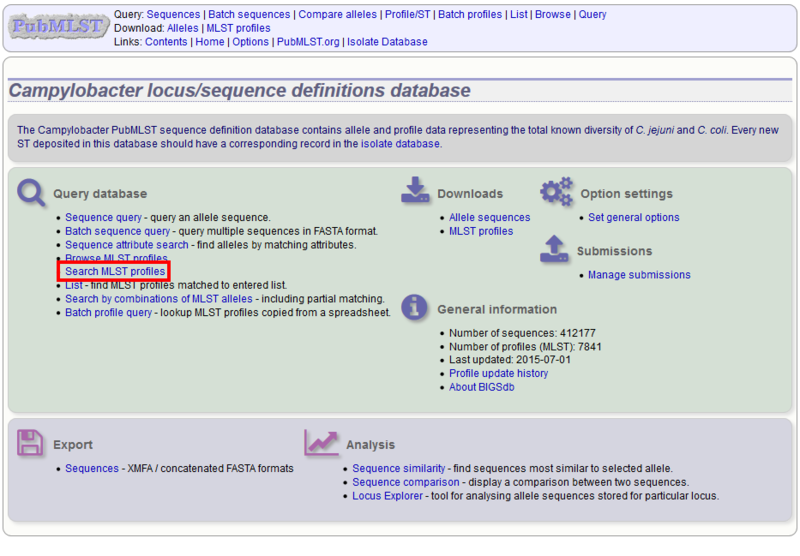 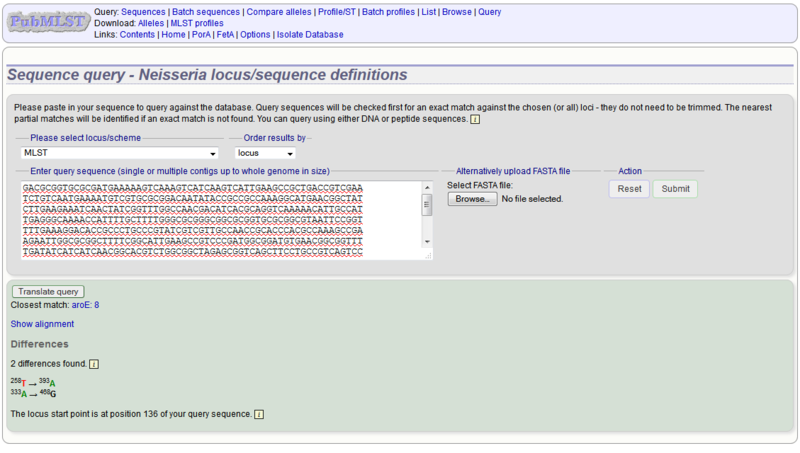 To query these, you need to navigate to a locus-specific query page, by clicking the ‘locus-specific query’ link on the sequence attribute search page. If a sequence definition database has schemes defined that include a primary key field, i.e. 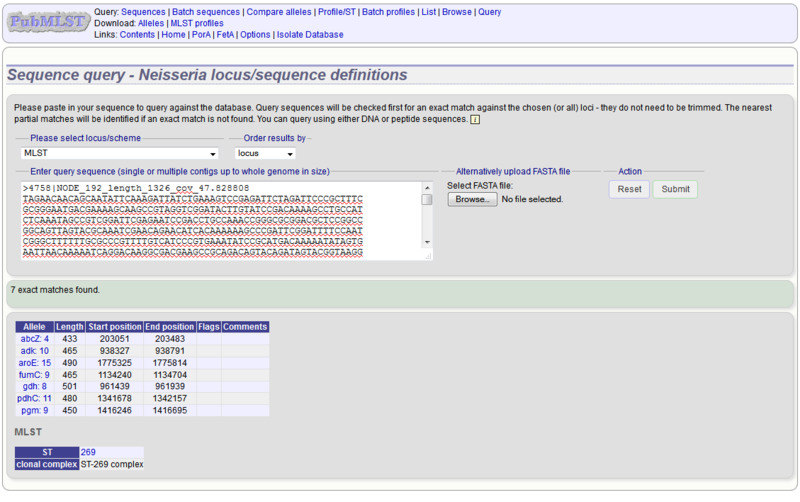 collections of loci that together create profiles, e.g. 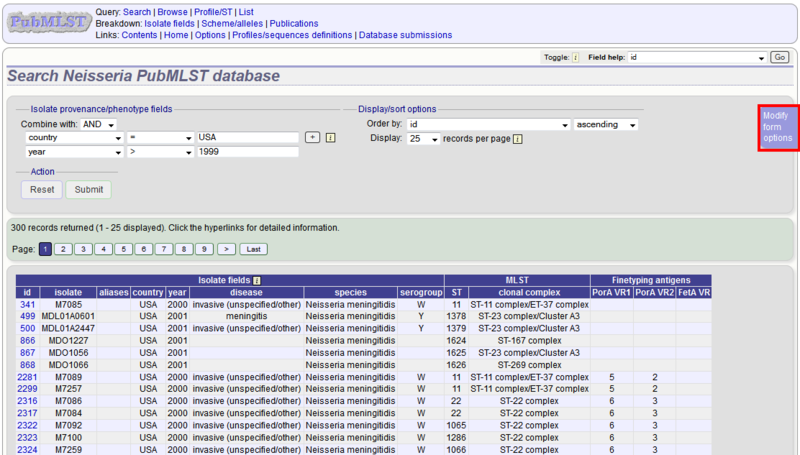 for MLST, click the link to ‘Browse profiles’. 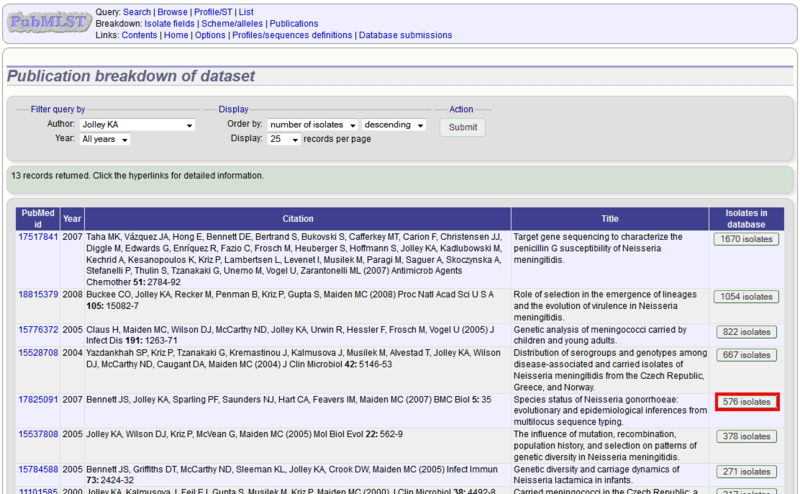 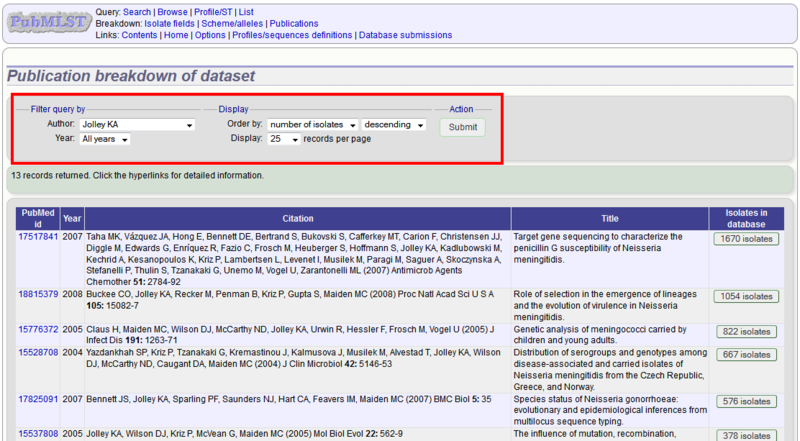 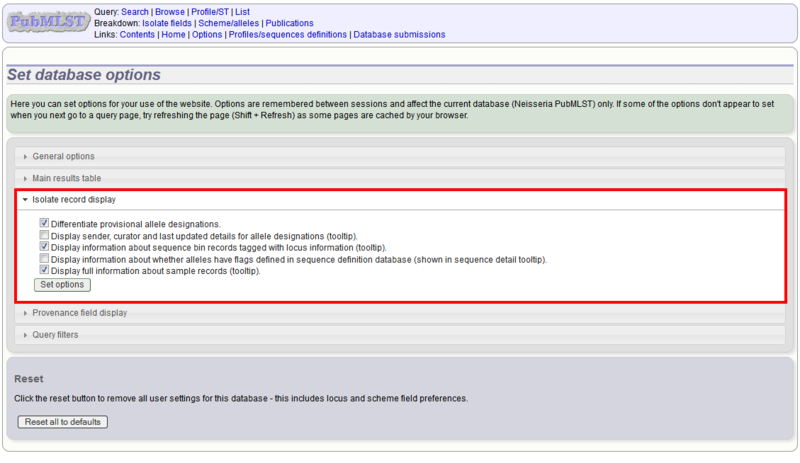 Choose the field to order the results by, the number of results per page to display, and click ‘Browse all records’. 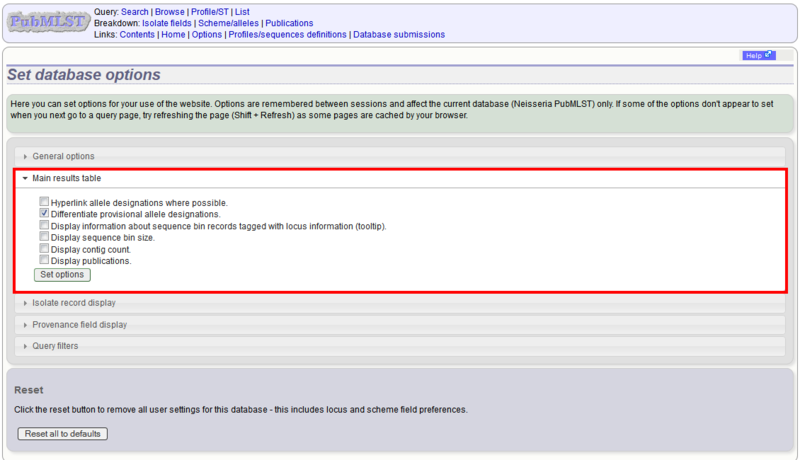 click the link to ‘Search profiles’ for the appropriate scheme on the main contents page. 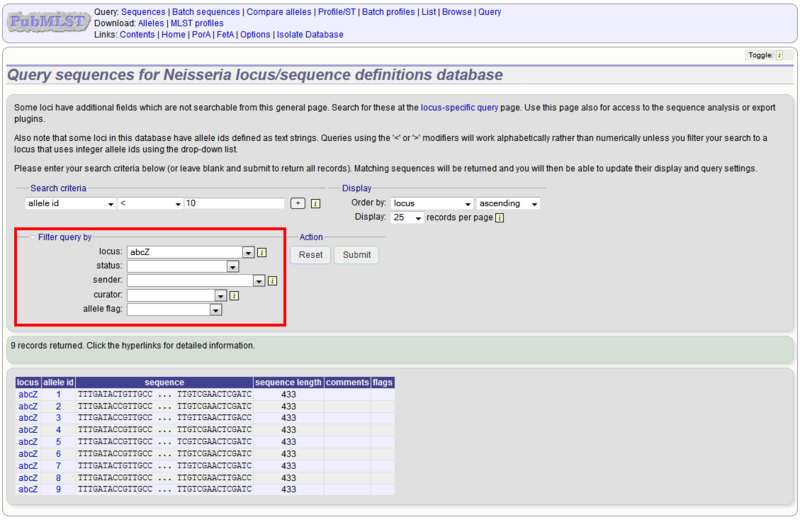 Enter the search criteria you wish to search on. 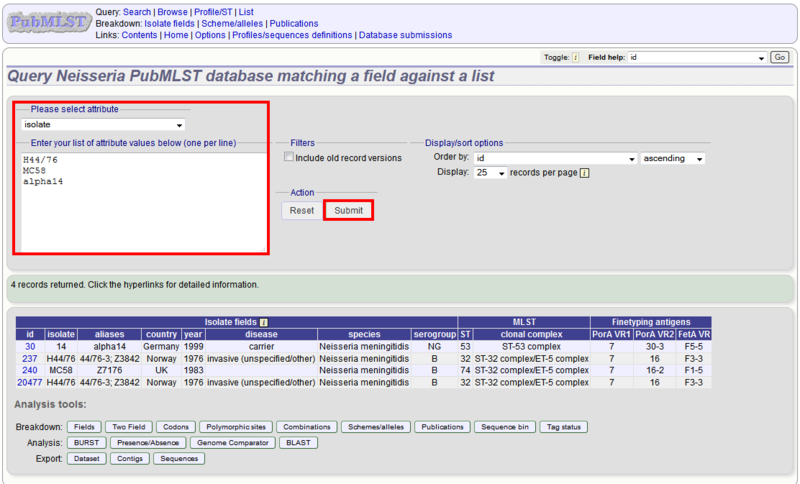 You may also see some drop-down list boxes that allow further filtering of results. 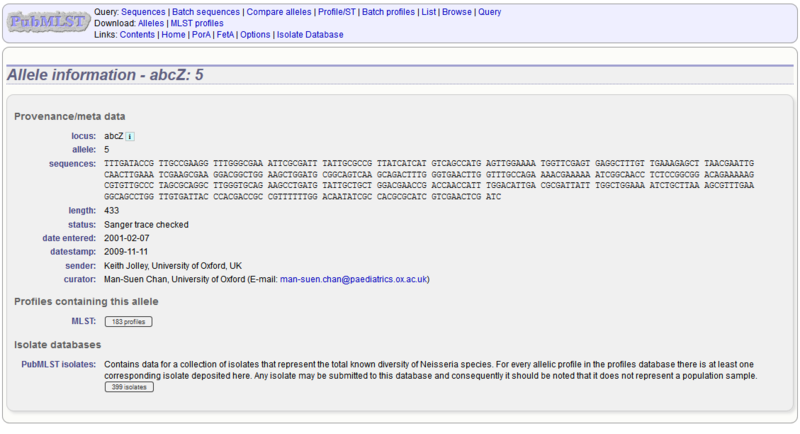 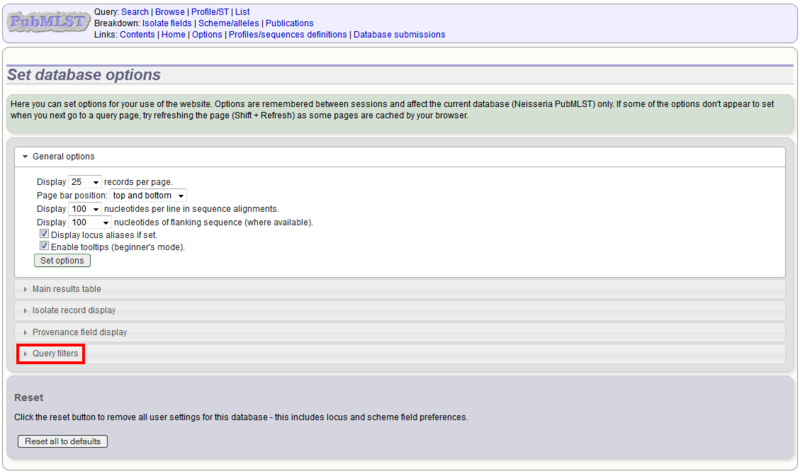 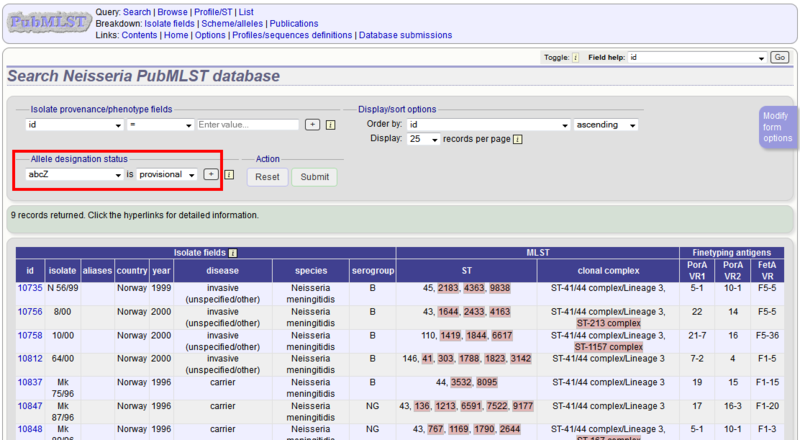 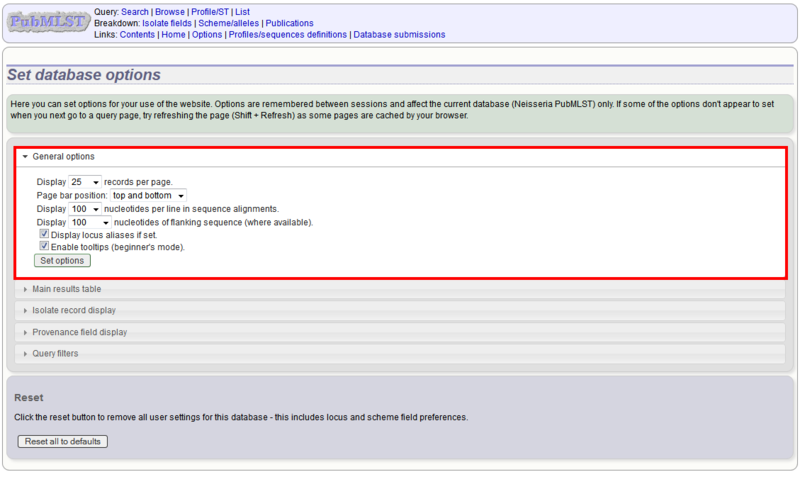 You can add search criteria by clicking the ‘+’ button in the ‘Locus/scheme fields’ section. 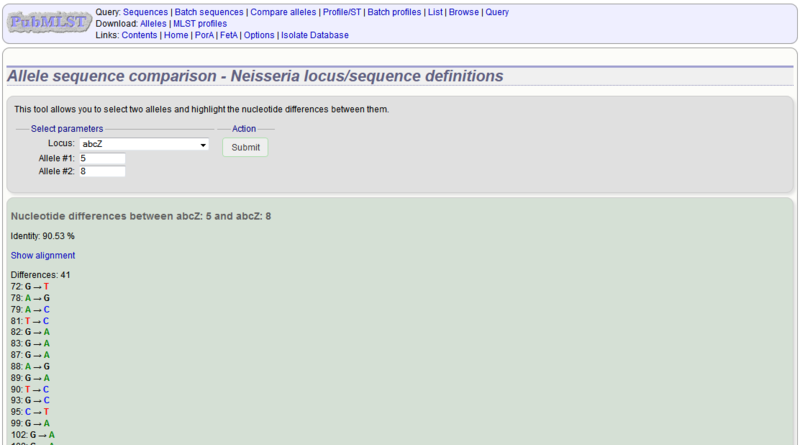 These can be combined using ‘AND’ or ‘OR’. 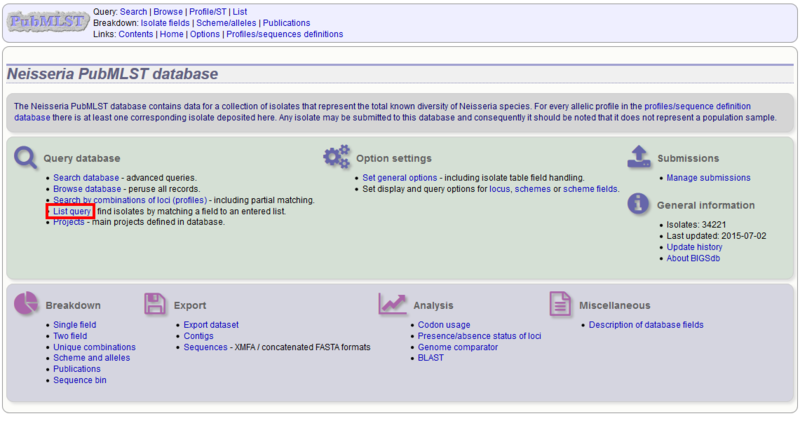 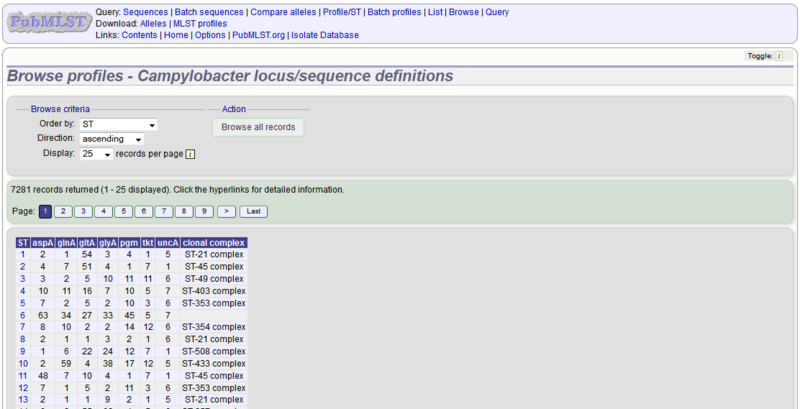 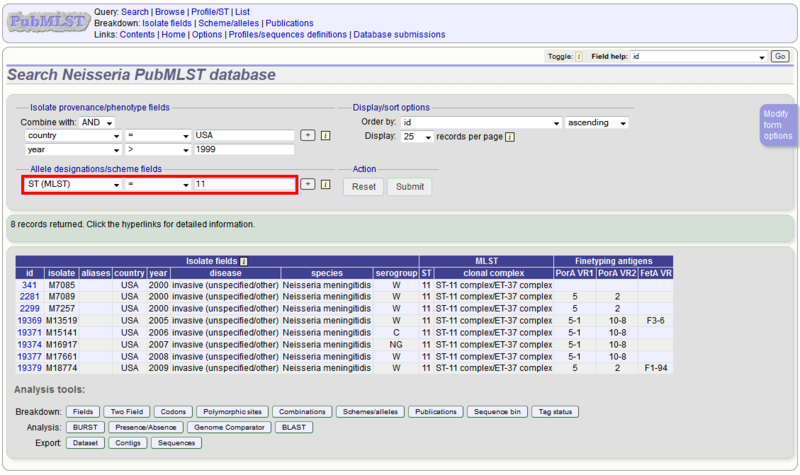 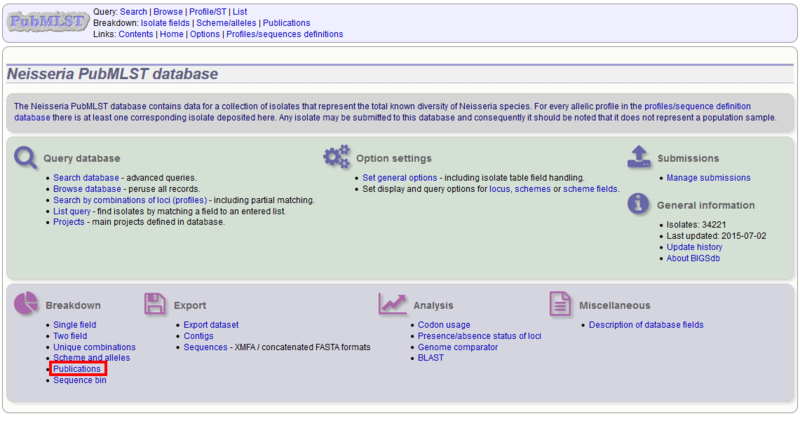 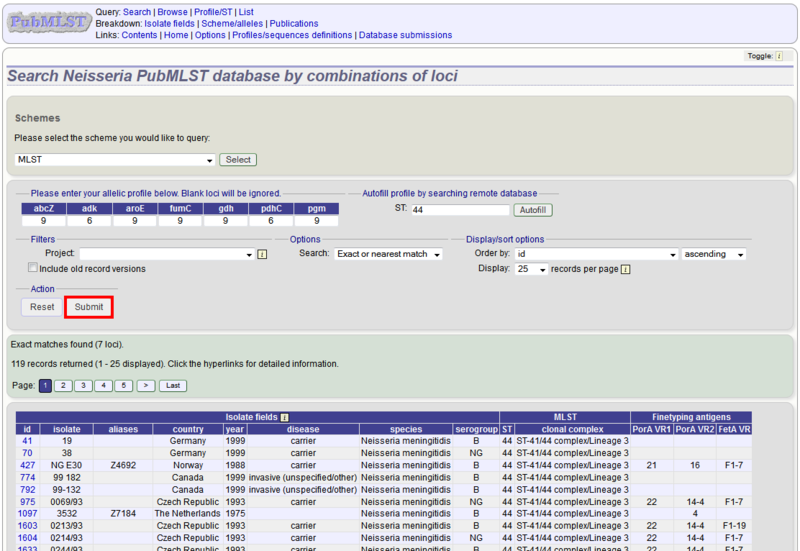 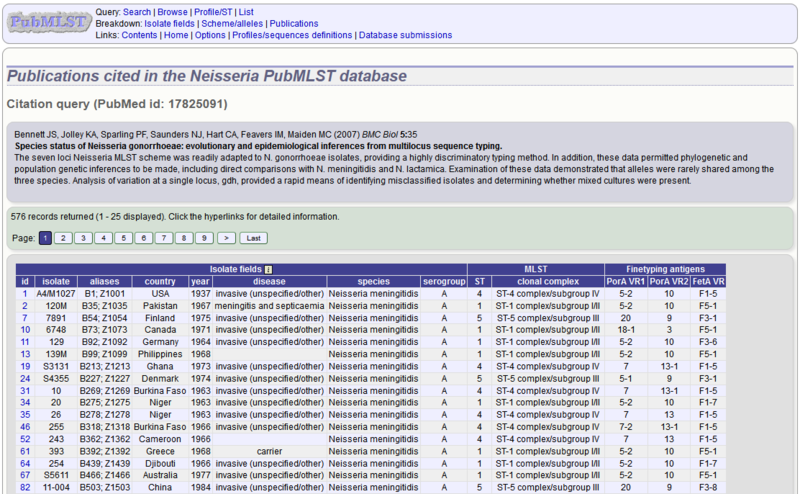 The ‘Search database’ page of an isolate database allows you to search by combinations of provenance criteria, scheme and locus data, and more. If the interface is modified, a button to ‘Save options’ becomes available within the tab. 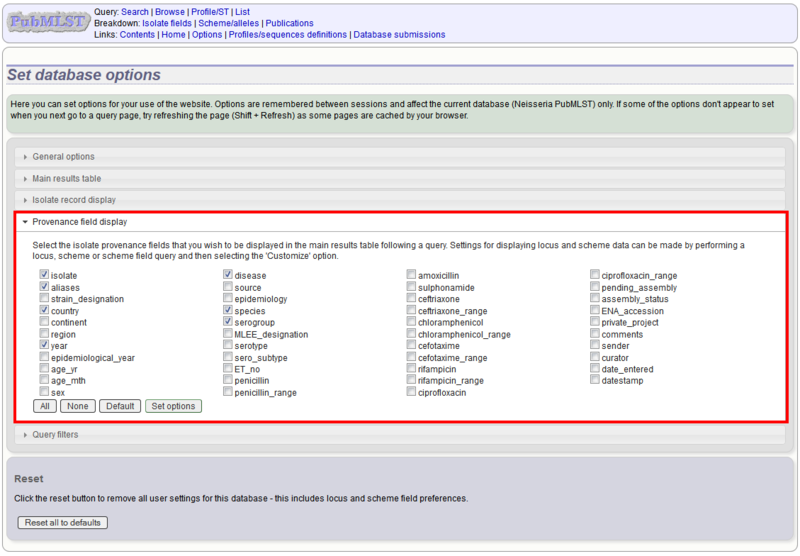 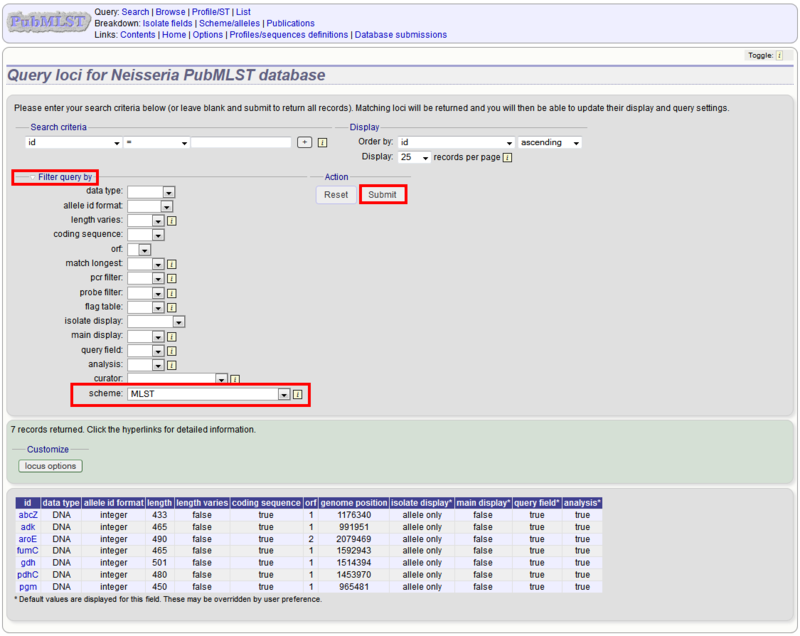 If this is clicked, the modified form will be displayed the next time you go to the query page. 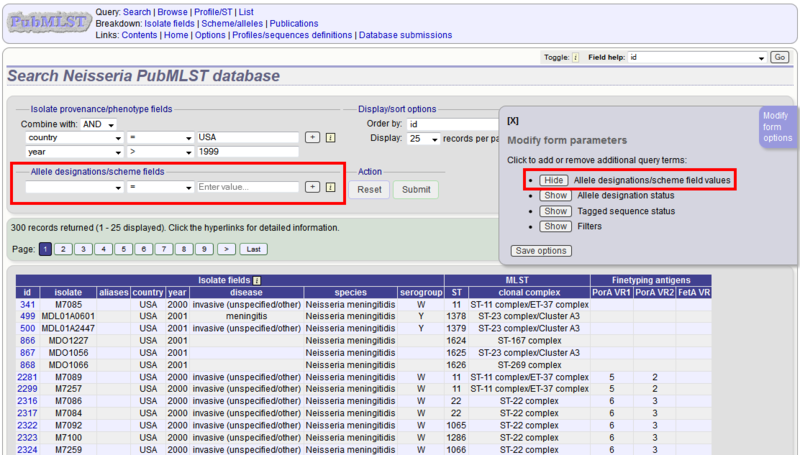 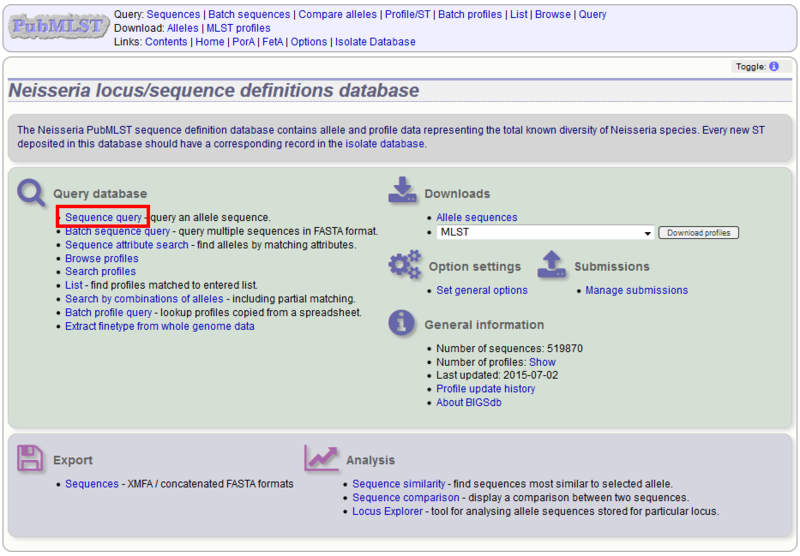 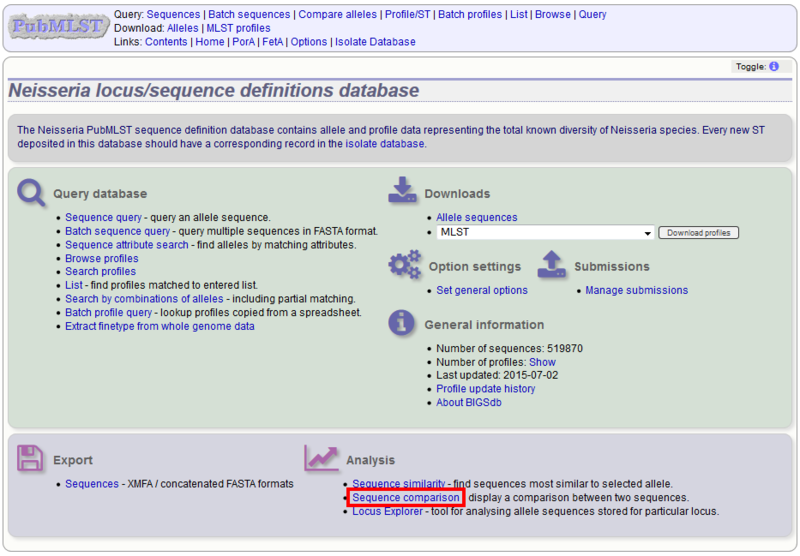 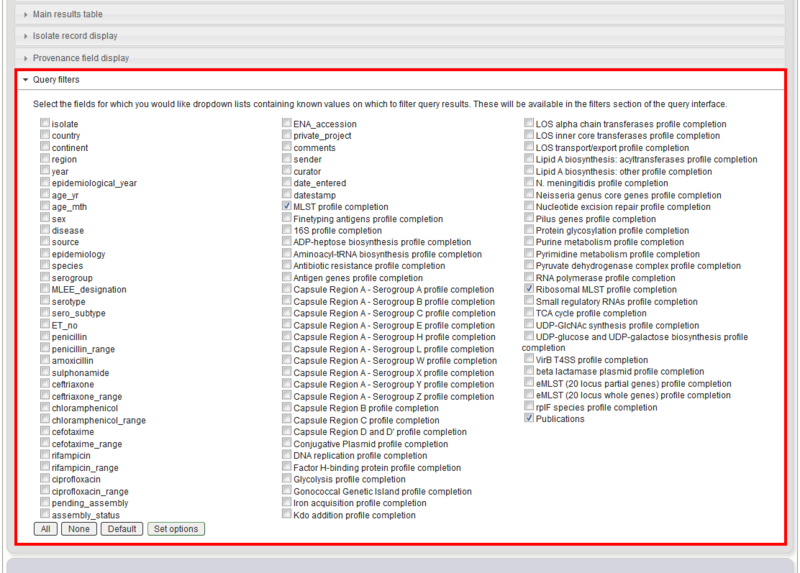 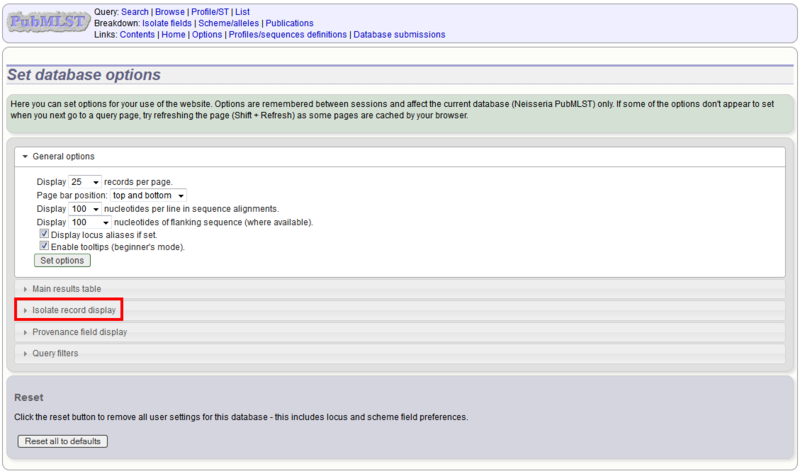 Both isolate and sequence definition databases can be queried against a list of values matching any criteria (isolate provenace fields, alleles, or scheme fields). 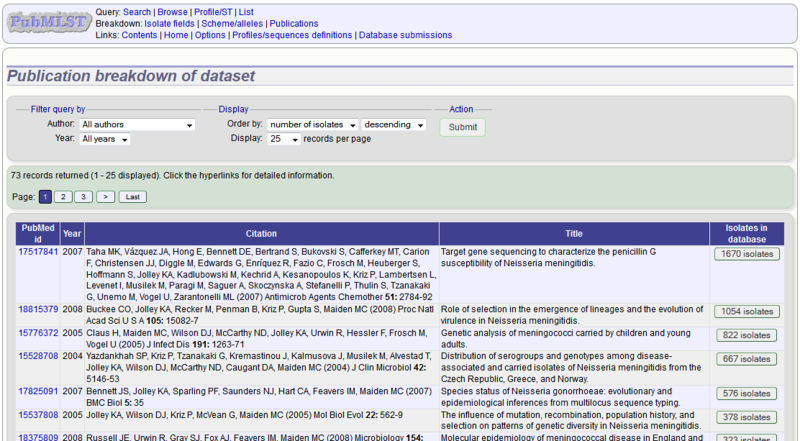 Click ‘List query’ on the main contents page. 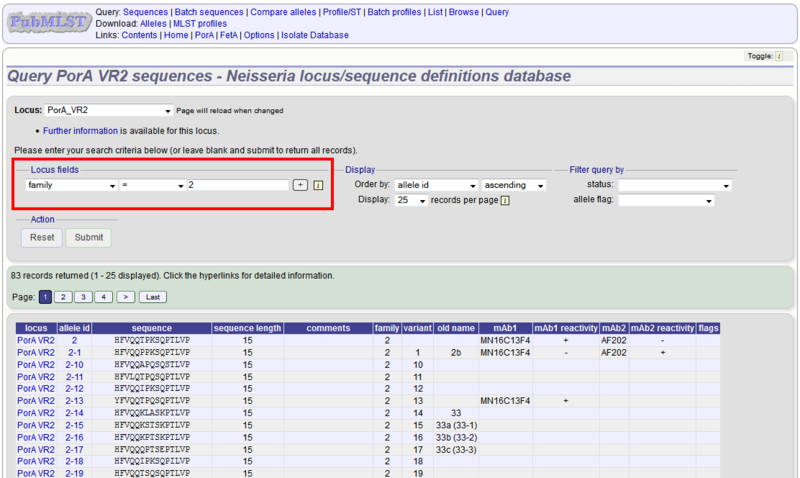 Select the attribute you wish to search against in the drop-down list box and enter the list of attributes in the box (one per line). 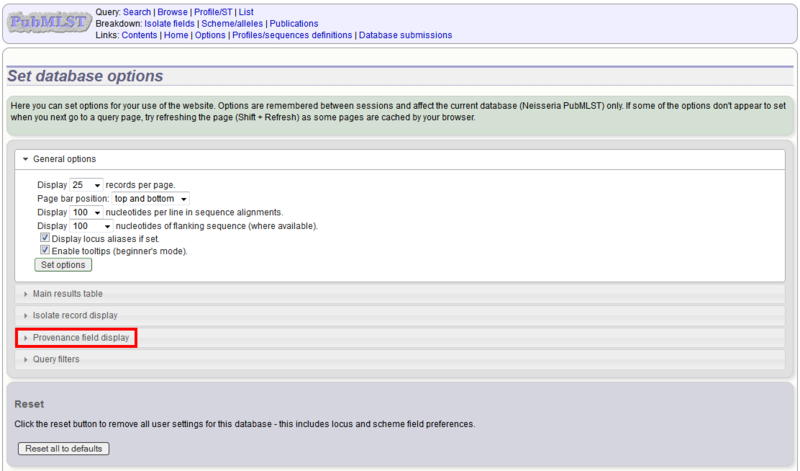 Click ‘Submit’.